Another mid-January and another start of Dine-Out Vancouver... If you were expecting a post with a DOV preview (like last year), you've come to the wrong place. As much as I see the value of DOV for many people and the fact it has definitely improved over the years, I don't usually participate. So to celebrate the beginning of DOV 2016, Viv and I visited a non-DOV restaurant in the newly-opened Grapes & Soda. 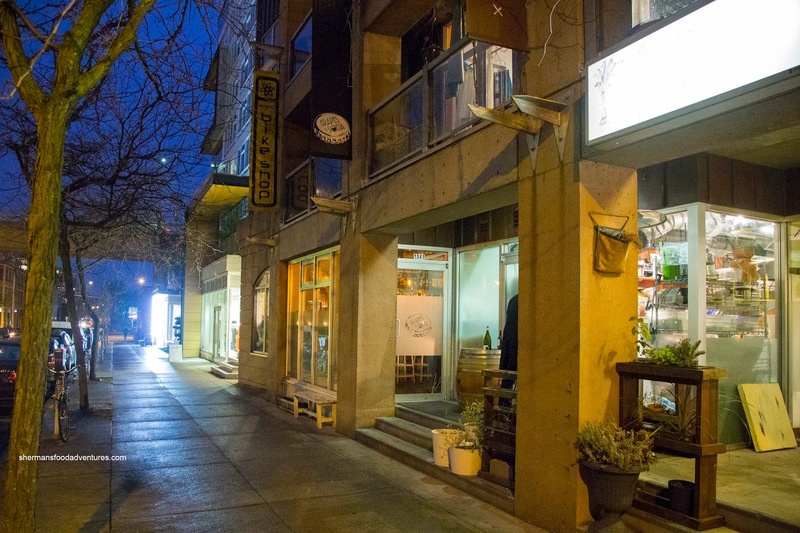 This decision was also partially influenced by the fact we have reservations at Famer's Apprentice the following week (they are sister restaurants). We actually arrived pretty early being able to take advantage of their happy hour. 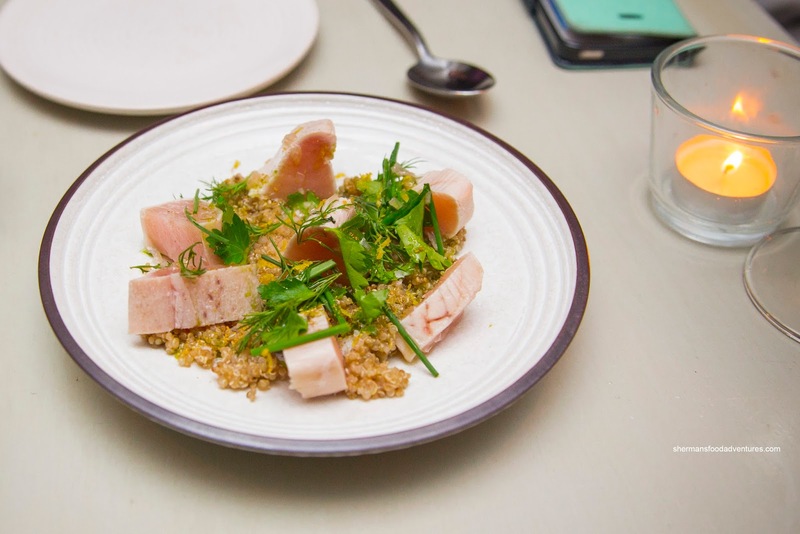 In addition to $7.00 glasses of wine, we jumped on the reduced price on the Seared Albacore Tuna with quinoa, herbs and lemon dressing. Buttery, appealingly soft and nicely salted, the tuna was on point all-the-way. Unfortunately, the quinoa was sub-par being soft and lifeless. At the very least, the impactful acidity from the lemon kept things bright. 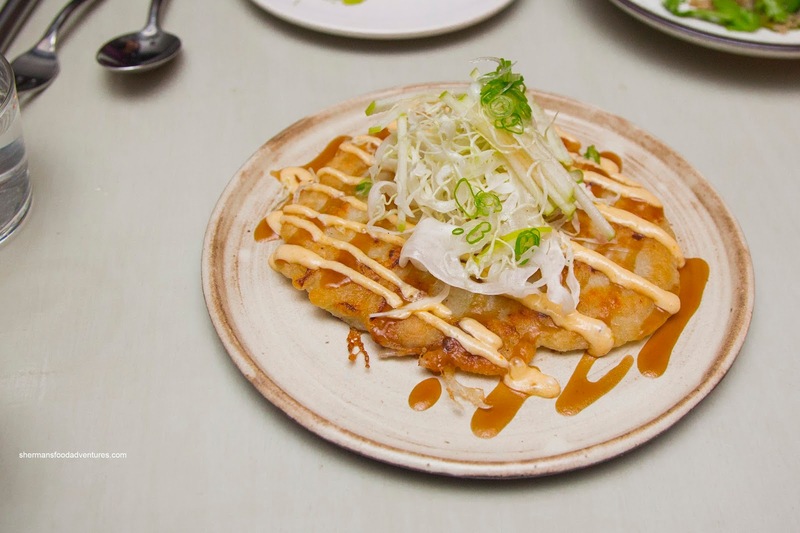 Also on the happy hour menu, the Okonomiyaki was topped with a cabbage and apple slaw drizzled with a house-made mushroom teriyaki and spicy mayo. 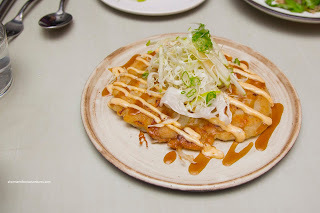 Lightly crispy on the exterior and completely soft in the middle, the flavours were subtle including the woodsy teriyaki sauce and the slightly acidic slaw. 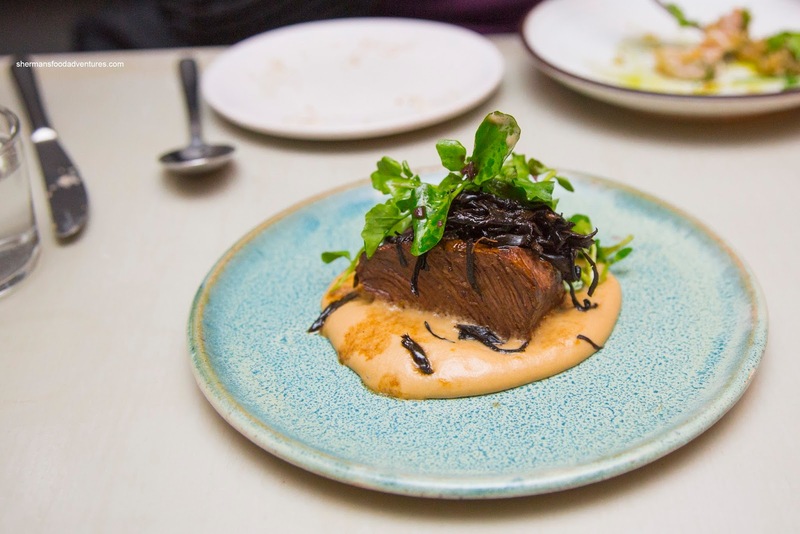 Moving away from the happy hour menu, we went for the Braised Chuck Flat with trumpet mushrooms and atop caramelized onion foam. As much as the meat was completely lean, it was moist and fork tender. The braise was able to penetrate the meat where there was uniform flavour that was natural and meaty. This was accented by the sweet onion foam and the firm Earthy chew of the mushrooms. 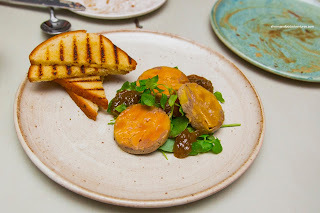 At first, I didn't notice the daily feature of Foie Gras Torchon with grilled brioche, wild greens and fig jam, but when Viv pointed it out, I was all over it. Texturally, it was on point being buttery and rich. However, it was far too salty for my liking. Even with the addition of the syrupy sweet jam, the flavours didn't balance. We found the grilled brioche to be firm enough while retaining an airy softness. 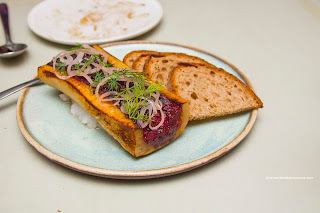 Our final item was the Stuffed Bone Marrow featuring beets and served with crostinis. Normally, bone marrow would be heavy and greasy, but with the addition of beets, this was lessened to a degree. I found the beets to be only mildly sweet. They were a touch heavier due to the absorption of the bone marrow fat. I liked how they didn't overseasoned the mixture so that we could taste the bone marrow. Based on these dishes (and there were not many more on the menu), we thought Grapes and Soda was a pleasant and reasonably-priced spot for some shared bites to go with our beverages. This could easily be a place to visit on a regular basis.